Nike Sportswear‘s Huarache E.D.G.E. TXT model prepares for the spring weather with its upcoming colorway. Its lightweight base is covered in white – midsole included – while the runner’s overlay and eyestays are seen in game royal and hyper jade, respectively. The snug upper sees a mix of neoprene towards its ankle entry while the toebox incorporates a breathable mesh. In addition, the midsole adds a contrasting black pod on the forefoot as well as the toe and heel of the outsole. 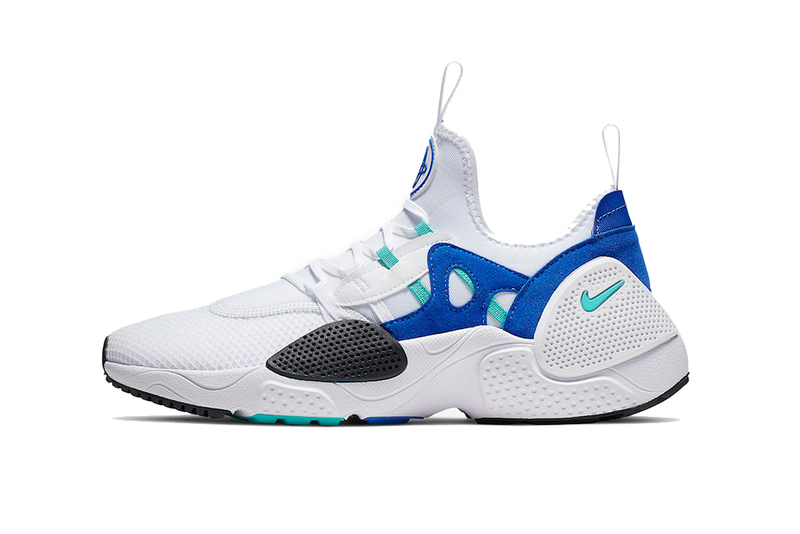 Lastly, the recognizable Huarache logo is applied to the tongue as a nod to related silhouettes. This edition of the Nike Huarache E.D.G.E. TXT is expected to launch in the coming weeks for $110 USD at select Nike Sportswear retailers and Nike.com. Take a look at the forthcoming colorway above and let us know how it compares to previous color schemes like its Heron Preston collaboration. In related news, the Paris Saint-Germain x Nike Epic react Flyknit 2 shares a black and pink mashup.